WASHINGTON, DC, December 22, 2009 (ENS) – The U.S. Environmental Protection Agency today finalized a rule setting stricter exhaust emission standards and cleaner fuel standards for large marine diesel engines on large U.S.-flagged ships, a part of the agency’s long-term strategy to reduce harmful marine diesel emissions. The regulation under the U.S. Clean Air Act harmonizes with international standards and will lead to air quality improvements throughout the country, said EPA Administrator Lisa Jackson. “There are enormous health and environmental consequences that come from marine diesel emissions, affecting both port cities and communities hundreds of miles inland. Stronger standards will help make large ships cleaner and more efficient, and protect millions of Americans from harmful diesel emissions,” said Jackson. EPA believes that diesel exhaust is likely to be carcinogenic to humans by inhalation. Children, people with heart and lung diseases, and the elderly are thought to be most at risk, the agency says on its fact sheet about the new final rule. The emission standards announced today apply to new marine diesel engines with per-cylinder displacement at or above 30 liters, called Category 3 marine diesel engines, installed on U.S.-flagged vessels. The standards will apply in two stages: near-term standards for newly-built engines will apply beginning in 2011, and long-term standards requiring an 80 percent reduction in nitrogen dioxides will begin in 2016. The final engine standards are equivalent to those adopted in the amendments to Annex VI to the International Convention for the Prevention of Pollution from Ships, known as the MARPOL treaty. MARPOL Annex VI is being amended to add new levels of engine NOx emission standards and fuel sulfur limits. The pending amendments consist of a two-part program, with stringent new global standards for nitrogen oxide, NOx, emissions beginning in 2011, new global fuel sulfur standards beginning in 2012, plus more stringent NOx and fuel sulfur controls that will apply in designated emission control areas. The new final rule allows for the production, distribution, and sale of 1,000 ppm sulfur fuel for use in emission control areas. During the public comment period, which ended in September, the American Lung Association and the Environmental Defense Fund commented that they strongly support EPA’s proposal to mirror the fuel standards required in emission control areas, and noted that without this rulemaking, refiners would not be able to produce fuel with a sulfur level of 1,000 ppm. The World Shipping Council and the Pacific Merchant Shipping Association also submitted comments in support of the 1,000 ppm sulfur level. Many PMSA companies already are using low-sulfur and ultra low-sulfur diesel. Others are exploring the use of ethanol-blended diesel, emulsified diesel, biodiesel and propane, the association says. 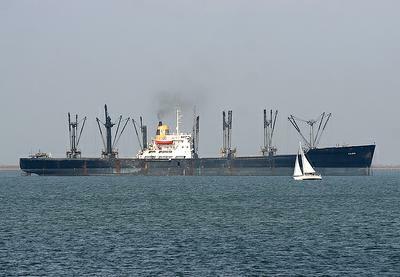 The International Maritime Organization, a United Nations agency, is set to vote in March 2010 on the adoption of the joint U.S.-Canada emissions control area, which would result in these stringent fuel and emissions standards for large foreign-flagged and domestic ships operating within that designated area. Air pollution from large ships, such as oil tankers and cargo ships, is expected to grow rapidly as port traffic increases, Jackson says. By 2030, the EPA’s domestic and international strategy is expected to reduce annual emissions of nitrogen oxides from large marine diesel engines by about 1.2 million tons and particulate emissions by about 143,000 tons. When fully implemented in 2030, this coordinated effort will reduce NOX emissions from ships by 80 percent, and particulate emissions by 85 percent, compared to current levels. The emission reductions from the strategy will yield health and welfare benefits that span beyond U.S. ports and along coasts, reaching inland areas. The EPA estimates that in 2030, this effort will prevent between 12,000 and 31,000 premature deaths and 1.4 million work days lost. The estimated annual health benefits in 2030 as a result of reduced air pollution are valued between $110 and $270 billion, which is up to nearly 90 times the projected cost of $3.1 billion to achieve those results. The estimated operational and hardware costs of implementing the coordinated strategy are approximately $1.85 billion in 2020, increasing to $3.11 billion in 2030. The operational costs in 2020 are estimated to be $1.82 billion. Nearly 89 percent of the 2020 costs are attributable to the fuel sulfur provisions. The hardware costs to apply engine controls to U.S.-flagged vessels are expected to be $31.9 million in 2020, increasing to $47.4 million in 2030 as more ships are built to comply with Clean Air Act Tier 3 NOx standards. The EPA says consumers of the goods carried on U.S.-flagged cargo ships will eventually pay these “minimal” costs.